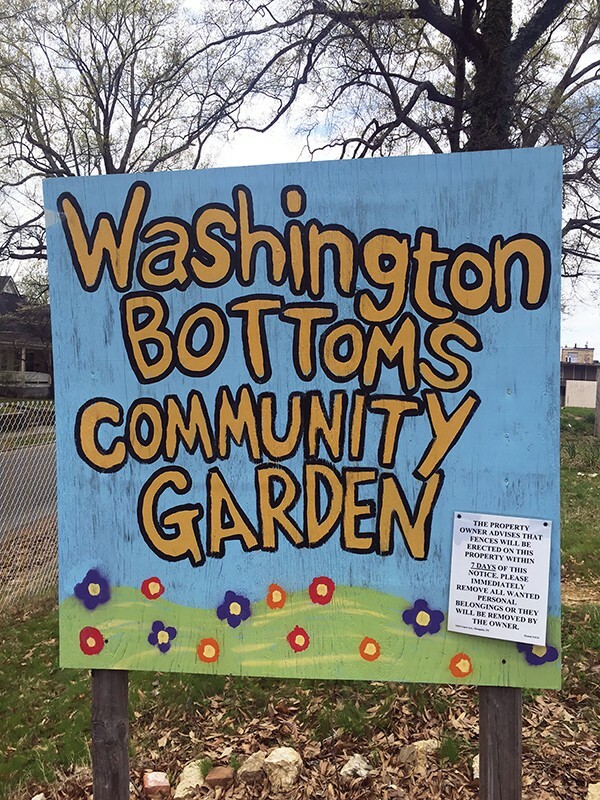 Property owner issues eviction notice to Washington Bottoms Community Garden crew. Last Saturday, despite the chill in the air, a few plants were beginning to spring up in the mostly barren raised beds in a community garden plot at Court and Watkins. But the people who planted them won't have a chance to tend to or harvest their crop this year. Without much explanation, the Washington Bottoms Community Garden crew has been evicted from the land they've tended to for the past several years. The garden has served not only as a place to grow food but also a meeting place for Homeless Organizing for Power and Equality (H.O.P.E., the group behind the garden) and the residents of the mostly low-income, international community in Washington Bottoms. But earlier this month, the property owner posted signs all around the garden ordering the crew to evacuate the land. "I was there all the time, and I met some fabulous people working in the garden. We had a lot of great times together. We celebrated birthdays there and holidays. We had a snowball fight and movie nights," said Antonio Harris, a member of the H.O.P.E. garden crew. "I wish the garden wouldn't go away. It's a sad situation, and I hate that we have to leave." 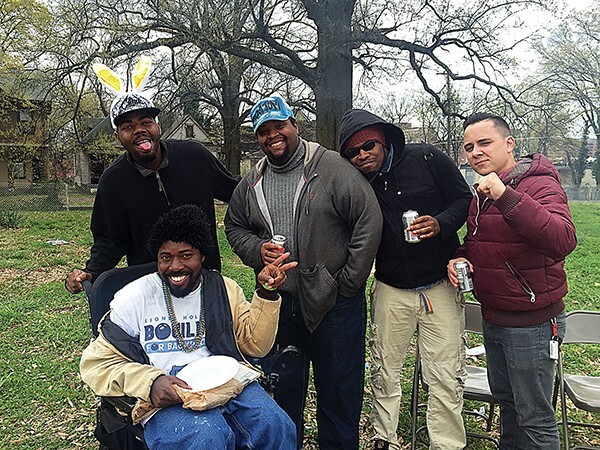 Last Saturday, the H.O.P.E. garden crew gathered one last time at the garden. A few tended to burgers and hot dogs on a charcoal grill while others played badminton. Neighborhood kids sang Taylor Swift songs on a karaoke machine. A laminated sign stapled to the hand-painted Washington Bottoms Community Garden sign read "The property owner advises that fences will be erected on this property within 7 days of this notice. Please immediately remove all wanted personal belongings or they will be removed by the owner." That property owner is Tennessee Health Management, the management group over Court Manor Nursing Home. Court Manor was located on that plot of land years ago, but the building was torn down and relocated downtown. The vacant plot is one of many empty plots in Washington Bottoms. Most were once home to apartment buildings that were torn down to make way for a planned big-box retail development spearheaded by Florida-based WSG Development. The plan failed when WSG defaulted on their loan during the recession. About 18 acres of the WSG property was purchased by Kroger last year, but the Washington Bottoms Community Garden plot is still owned by Court Manor/Tennessee Health Management. Last year, garden crew members met with representatives from Kroger to request that, if Kroger also purchased their garden land, that they be allowed to stay until any new development began. "Kroger told us they intended to buy the property, but they said they shouldn't develop it for another five years, so we were talking about a land use license," said H.O.P.E. garden crew member Jamie Young. A spokesperson for Kroger said they don't have a contract on the land, and they were only made aware the group was being evicted when H.O.P.E. sent Kroger an invite to the garden's farewell party. A representative from Tennessee Health Management, Jonathan Cooper, also would not confirm any sale of the garden land. "No final decision has been made on a sale. All we're trying to do is make the area safe and secure," said Cooper, when asked why the H.O.P.E. garden crew was being kicked out. Young said the group actually had Court Manor's blessing to garden there, and in the past, had been praised by the company for making the land, which previously had a reputation for being a high-crime area, safer by keeping it occupied. The garden became so accepted by the people living in the neighboring apartments that they'd often send their kids over to help H.O.P.E. members work in the garden. And neighbors would often attend movie nights, fund-raisers, and other events H.O.P.E. held there. "When we started, the land was completely littered with trash and junk car parts and broken glass and couches. There were a couple nights there that we heard gunshots. There was a history of gang violence right on that corner, and the surrounding apartments were mostly minorities living at a level of poverty," said H.O.P.E. garden crew member Dallas Holland. "And then one day when we were out there, I heard laughing and kids running around and music. We were blowing giant bubbles with a bubble gun, and it was the moment that it hit me that this was more amazing than we ever meant it to be." The garden crew would like to move to another plot in Midtown, but they haven't found a space that's convenient for H.O.P.E. members, some of whom are homeless, or for Washington Bottoms residents, many of whom do not have transportation.